Trendy 350ml double wall borosilicate glass coffee cup which has a secure push on silicone lid and a large silicone band. 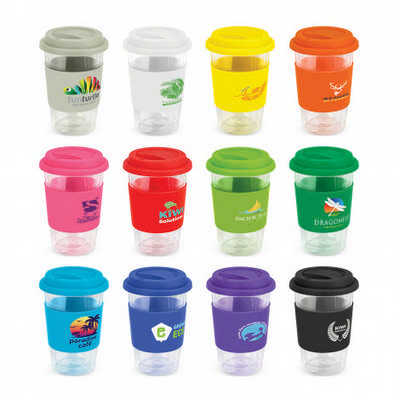 The double wall keeps drinks hot for longer and the surface remains comfortable to touch. The lid and band can be mixed and matched in any colour combination from the colour palette at no extra cost. Up to five different colour combinations are included in the price and more are available for an additional charge. Borosilicate is a lightweight glass which is exceptionally strong and shatter resistant. Glass is a natural choice for a clean, pure taste and it offers a safe and eco-friendly alternative. It is presented in a black gift box and handwashing is recommended. Colours: Cup: Clear. Dimension: Dia 88mm x H 144mm. Print Description: Band - 80mm x 40mm (one colour). Print Type: Screen Print . Packing: Black box. Price includes : 1 Col 1 Pos Print. Setup is included.